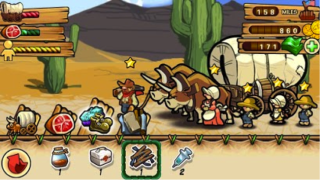 The Oregon Trail is a mobile version of the classic historical simulation game originally designed for PC. Strong pioneer simulation game with secondary emphasis on history. Pros: Kids actively participate in historical events and create meaningful connections by making choices that affect their pioneer family's fate. Cons: Mini-games stray from learning objectives, even though some historical facts are layered on top. Bottom Line: Classic westward expansion game just as fun as ever, but would benefit from some diverse updates.